I first came across Pooh’s Heffalump Movie by borrowing its soundtrack from the library. My son enjoys soundtracks, both Disney and Broadway, so we regularly grab one on our weekly visit, listen to it in the car, enjoy the music, take it back. But this one stuck with me. Perhaps it was the reminder of my own childhood love of Winnie the Pooh movies, or perhaps it was the never-ceasing talent of Carly Simon, who wrote & performed the music of the film. But whatever it was, I found myself singing along with these new songs just as much as my son was. So when I noticed that Netflix had Heffalump available on instant, I sat down with my kids to watch it, and was not disappointed. 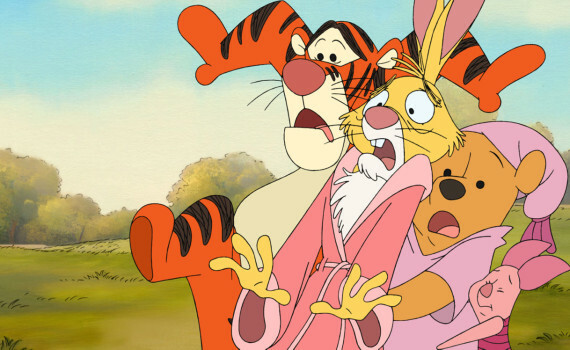 In the Hundred-Acre Wood, adventure lurks around every corner. This time, that adventure will befall the littlest member of the Wood, Roo the Kangaroo. When a strange sound awakens all our old friends, they each have a theory on its purpose. But wise Rabbit knows what strange beast left its footprints in the ground around their homes; the dreaded Heffalump. Details on what it exactly is are sketchy, but the animals devise means to hunt & capture it, before it can harm their way of life. Roo sets out on his own mission to find a Heffalump, but runs into a friendly little elephant-like creature named Lumpy instead. The two become fast friends, but when Roo finds out that Lumpy is the enemy, true friendship will be put to the ultimate test. This is the heart-warming children’s movie you’d expect, complete with the characters that we loved in our very own childhoods. The voices, the classic songs, the Wood; it’s all there for our entertainment. But the new elements are what make this movie really fun. The animation has been perfected and sparkles on the screen. The new adventure of Roo & his friend is a welcome offshoot of the standard Milne tale. And the music, that’s where it gets me. Though not all the songs from the soundtrack are performed in the film, there are enough to grab your attention, quality music produced by Carly Simon and filled with youth & wonder. On a side note, my kids found this movie to be hilarious, one of the funniest they’ve ever seen. And at just 1 hour, it’s easy to sit down & watch whenever you have the spare time. Though not a brilliant or instant classic, Heffalump has a lot to offer.